In Genesis, there is a picture of a father walking with his son up a hill. The son does not know what awaits at the top. He of course knows there will be a rope, a knife, and an altar. He knows there will be death, but he does not foresee that the death would be his own. “By faith Abraham, when God tested him, offered Isaac as a sacrifice” (Hebrews 11:17a). Albert Camus once said, “In a universe suddenly divested of illusions and lights, man feels an alien, a stranger. His exile is without remedy since he is deprived of the memory of a lost home or hope of a promised land. The divorce between man and life, the actor and his setting is properly a feeling of absurdity.” Camus speaks of the painful knowledge that comes upon a person when hope is gone, when a world, once explained, seems explained away. From one’s youth, life is chock-full of expectation, a hopeful exuberance exuding possibility; sun and trees, birthdays and music. But the truth comes upon us in pieces, like the time you first learn the meaning of divorce, or realize that cancer is more real than rabbit holes leading to Wonderland. For me, it was when the ambulance arrived at the hospital and I saw the paramedics pull out the stretcher, the wheels clanging and clacking against the sidewalk. No one was allowed to go into the emergency room except a stream of trauma doctors and nurses. When our family was allowed in, we found my brother strapped to a table—arms, legs, and neck all stuck stone still. We were stunned. My mother cried. I held my brother’s arms and my dad tried to talk. We all tried…but there were too few words and not enough strength. I got close to his face. I let my forehead touch his. I cried. I cried because you cannot fix broken vertebrae with charisma and soothing words, because you cannot take back the bad decisions of a stupid kid, because split seconds in life cannot be undone… because paralysis is permanent and sometimes death seems close. I had been taught and believed in a God who is love, but as I walked outside that night I did not see him. I saw the stars and I felt their indifference. They hung on nothing, unabashedly distant, billions of miles away draped in nothing but cold and silence. Where was God? Was this his will? Or was it just the crescendo of a myriad of chance occurrences, dominoes falling until it all ends… a turn in the road, a momentary flight, crushed vertebrae, blinking lights and beeping machines? There are settings where the all-consuming silence is not one of absent nurses and doctors, but the silence of God—where his commands to faith seem utterly irreconcilable with the cost. In God’s silence we find our own—the silence of our hearts, of our praise, of hope—the silence of our faith. I met Jesus among a throng of thousands when I was fifteen. I went up the mountain. I saw God. I felt like Moses after coming down, face shining. And yet, most days are not like that. There are days when the fire of Sinai is a distant memory to the present darkness. To be a Christian “by faith alone” is to know Jesus, but not in the way we often think, not in the way Middle School love knows that it is “always and forever.” To know Jesus by faith alone is rather to wrestle and rage and dare to trust even in the confusion—in quiet hospital parking lots, on dirt paths, on hills where crosses bear the silence of God. The doctrine of Sola Fide (faith alone) acknowledges that suffering is not a natural good, but that faith often picks up where our logic leaves off. It is the expression of what we cannot always logically justify to the world; faith is often our foolishness on display because “faith is the assurance of things hoped for, the conviction of things not seen” (Hebrews 11:1, NASB). For the Christian, suffering and faith are necessarily tied. They are the opposite sides of the coin called hope. In our inability to find the cure to our deepest heart longings, we are made aware of our true need. And it is precisely this need Christ has come to answer. Now, it is tempting to tie all this up in a neat package: I could tell you that my brother is a Christian today, and that in certain ways he credits his accident with opening the door to his need so he could see Christ waiting. I would tell you he is married to a wonderful young woman who loves him fiercely, and that he is a worship director at a mega-church. And it would all be true… but not honest. The significance of Sola Fide is not and never has been in the nice resolution we long for. Instead, it is the resolution that lies behind all longing. Remember that this world is not our home. 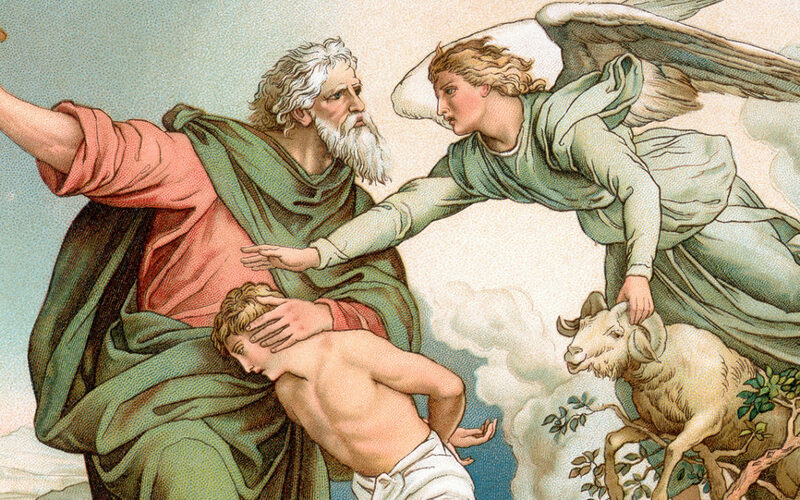 Remember that while God rescued Isaac from sacrifice, Isaac someday would still die. But while God spared Isaac, he did not spare his own Son at Calvary—because Christ’s heart for us is not grounded in this world, but in the next. In the Gospel, we are given the picture of a Father walking with his Son up a hill. The Son knows what awaits at the top. He knows there will be nails, a spear, and a cross. He knows there will be death, and he foresees that the death will be his own. …but he also knows that death is not the end of the story. He knows God is in this. In faith, we too can turn to Jesus, who lives in and with us, and know that in death there is life. In that seed dying, there is an everlasting harvest—a resurrection. In this life we are only experiencing the fall, the dying of one’s self. There is yet the hope of spring, when death itself will be undone. Jordan Spina is Pastor of Rock of Ages Lutheran Brethren Church in Seattle, Washington.